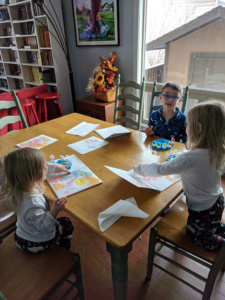 For anyone who is not familiar with the brand Color Wonder, it is a great series of products that allow kids to use craft supplies without having to worry parents about a big colorful mess. My kids have been using the markers and coloring books for years, especially when we go on trips. The markers are clear and only work on the specific color wonder paper. Last week, I came across Color Wonder finger painting. I was intrigued because it was the same concept of the markers. The ‘paint’ is clear, but the kids can still finger paint on the paper and get the colors on the special paper. The box said ‘mess free!”. In my head, I’m thinking, how is finger painting EVER mess free?? 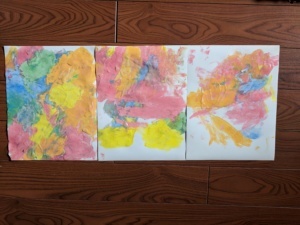 So, obviously, I had to try this mess-free finger painting with my kids. The kit comes with a set of five paints that are each labeled with a different color as well as the Color Wonder paper. The paint itself is more of a gel than a paint. The kids had fun painting, and if you can keep the gel on your hands, it isn’t too bad. I found that the gel clumps and my kids had a hard time managing the amount of paint that they used on the paper, but ultimately, in terms of mess, it wasn’t too bad. Until my daughter took off her shirt and put the sticky gel all over her body. Then we had to have a bath. So, mess free? Not so much. But it definitely appears less messy because you don’t have to worry about mixing colors and having the paint show up everywhere. I haven’t decided if I will buy the product again, but my kids did have fun and created a bunch of awesome artwork, so ultimately, as long as they are happy, that is the important thing.